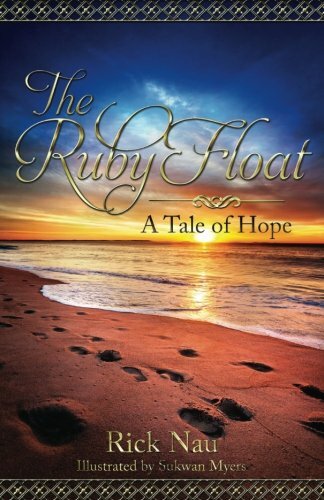 The Ruby Float by Rick Nau is a most beautiful Christian allegory. As with Rick Nau’s other book, Theodora’s Children, this story is timeless and relevant yesterday, today and forever. 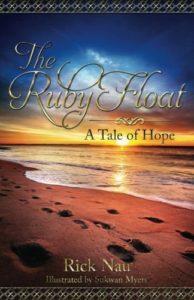 The Ruby Float is a story within a story. As the children sit at the feet of their great grandfather, the reader is reminded that Jesus told stories and people sat at His feet to listen. Within His stories were great truths, and so it is with The Ruby Float. Jesus asked that we come to Him as children. The Ruby Float demands to be read through the eyes of a child – wide eyed, full of wonder and open to the truths of the Alpha and the Omega. The reader is drawn into the story from the start, with delicious descriptions of a picnic, reminiscent of the Famous Five picnics of Enid Blyton. The style of The Ruby Float is warm and welcoming. The reader ‘feels’ the arms of the book figuratively wrap themselves around the reader. We long to hear the truths contained within the tale. Very much like C.S. Lewis’ Narnia, the reader enters a world where a spiritual battle still rains. We are reminded that it is a battle for our hearts, minds and souls. “If we probe a little deeper… we’ll find waters that are dark and disturbed.” We are required to shine as beacons of hope and light in a dark world. There is an air of love pervading the whole novel. The reader ‘feels’ included in this love but reads with heart breaking, “He worked… hoping… he could earn the love of his father and mother.” We are reminded that God loves us unconditionally. We do not need to earn His love. He already loves us. Within each one of us, there is a God-shaped hole that only He can fill. “He was longing for a love much greater.” Nothing but God will truly satisfy. There is an innocence and a child-like trust within the novel. The children instinctively know who they can and cannot trust. We need to know that we can trust God. We can trust Him in the calm waters and also when the storms rage. The Ruby Float contains words from scripture that lodge themselves in the reader’s heart, bringing a sense of peace and calm. I have found both The Ruby Float and Theodora’s Children incredibly beautiful. The words have penetrated my very being with their beauty and their truth. I think both books have the power to change lives and draw people closer to Jesus. Jesus drew others to Him through His stories – the same can be true today. People respond to stories. For me, The Ruby Float and Theodora’s children have the power to become classics and stand proudly beside C.S. Lewis’ Narnia books in homes and shops. They are not designed to be read once and forgotten. They are classics to read again and again. We can read them to our children and grandchildren. They are timeless classics that will last. Invest in The Ruby Float and Theodora’s Children today. See their beauty. Let them ‘speak’ to and impact your life and the lives of your children.